In the spirit of true Agility which encourages flexibility and a "whatever works" approach, Scrumban has become a popular framework in Agile software development. This combination of Scrum and Kanban incorporates the best of both world, and is commonly used in product development and maintenance. Scrumban integrates the benefits of both methods: the fundamental elements of Scrum’s Agile working are combined with Kanban's drive towards lean process improvement. While initially used for the transition from Scrum to Kanban, Scrumban has by today emerged as a standalone methodology. 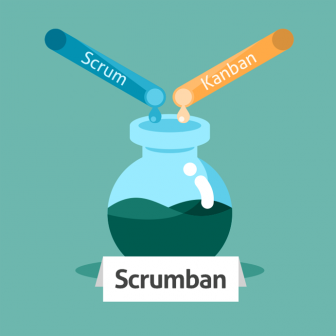 In a nutshell, Scrumban teams apply the Scrum approach in their development activities, and use Kanban to oversee, manage, and continuously improve their work (Kaizen). One of the really important (but often overlooked) values of Scrumban is that its principles and practices don't exclusively apply to software development. Scrumban may be used in other business functions where it will help promote lean thinking, waste reduction, and process improvement. Scrum focuses on small, cross-functional, self-organizing teams, requiring team members to split the work into a list of small, concrete deliverables. They will then set priorities and estimate the relative effort cost of each item. 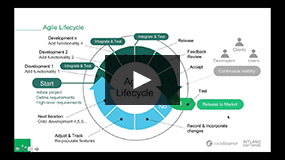 Scrum is based on short fixed-length iterations (usually 1–4 weeks), with potentially shippable code demonstrated after each iteration, and uses retrospectives to optimize the process after each iteration. Kanban is a workflow visualization tool. By splitting the work into pieces, writing each item on cards, and putting them on a board you can move these tasks around, visualizing the flow of works. Kanban has a few basic columns to group tasks (To do, In progress and Done) to illustrate the status of each item in the workflow. Setting Work In Progress (WIP) limits helps make sure all team members are tasked to capacity. Scrumban is a combination of these two methods. It helps increase product quality, shorten lead time and promotes continuous improvement. In practice, implementing Scrumban is no rocket science. Kanban helps make the flow of work visible, which in turn helps you discover bottlenecks in your process, enabling continuous improvement. When applying the Scrumban approach, you will initially want to maintain current roles and responsibilities. Scrumban is all about an evolutionary change, there's no need to "rip and replace" any processes. Using Kanban can result in higher efficiency with the combination of Scrum for development and maintenance teams. Ready to try Scrumban? codeBeamer ALM offers a preconfigured Scrum template out of the box, and an easy to use Kanban board to manage all the work. To give it a try, start your free evaluation project, or contact us for more info.